* Support files downloaded from iTunes, Amazon Video on Demand, Blockbuster, etc. Pavtube ChewTune legally gets rid of DRM protection embedded in WMV/M4V videos and “Digital Copy” movies that bundled with your recent DVD or Blu-ray titles, and creates DRM-free media files that you can enjoy on practically any capable device. This DRM Recorder software comes with optimal format templates for almost all popular multimedia devices, such as iPad mini, iPad, iPhone, iPhone 6/6 Plus, iPod, Apple TV, PS3, Xbox 360, Motorola Xoom, HP TouchPad, Samsung Galaxy Tab S/Galaxy Note 4/Galaxy S6/S6 Edge, Asus Eee Pad Transformer, Kindle Fire HD, PlayBook, and WD TV media player. With this DRM Removal tool, you can easily strip DRM protection from the original files and generate DRM-free copies in your wanted format. The output file formats include MKV, MP4, WMV, AVI, MPG, TS, ASF, MOV, M4V, MP3, AC3, AIFF, M4A, and so on. 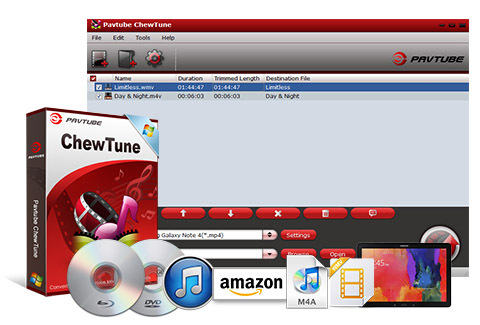 Pavtube ChewTune can process a number of DRM-locked files simultaneously. If you don’t want to wait around for the entire recording process, you can tick off “Shut down computer after conversion”. How to Convert and Burn iTunes Videos to DVD? How to Sync iTunes Movies to Google Drive? I’m a long time member of an audio book club online. And, can only play the files via their selected player. They were not compatible on my Galaxy S5. And, that made me very annoyed. Then I found out that I could download the ChewTune and strip out the DRM protection. Now the audio books are easily compatible with my Samsung Galaxy S5 so that I can listen to them when I am out of the house. What a great software to own! Not only lets me remove DRM protection but also converts for my Apple devices. Now I can watch my movies from Zune Marketplace, Xbox Live or Amazon Video on my Apple iPhone or iPad, anytime I want a little entertainment. No longer do I feel chained to my computer using just one device anymore. A very affordable purchase, best idea I’ve had so far. DRM can be a drag if your chosen hardware does not support it. You need something userfriendly and easy to remove it. ChewTune is IT. I use this to convert my iTunes songs into wave files so that I can use them for referencing in my studio work. This is very easy to use and reliable in translating the formats. i tried a lot of different software’s before this but none of them come even close in comparison to this . after drm removal now i can easily transfer my audio files to and from different devices. With so many DRM converters out there this one stands out as far as price and easy to use goes! I’ve tried 5 different ones and this one tops them all. Hi, this weekend is fastidious in support of me, as this time i am reading this great educational piece of writing here at my house. I am actually thankful to the holder of this web site who has shared this wonderful softwre at at this time. This application has saved me copious amounts of time on trying to find compatible videos for my Nabi 2 tablet. It’s awesome! I now can watch any iTunes videos and Amazon Instant video I want on my Galaxy Tab 3 and Galaxy S6!